Here we are, on the precipice. Like my poor Inky, viewing the vestiges of an act she cannot imagine. So let's take a gander back, oh, eight thousand years or more. When facts were myths—when gods walked Thedas... or strode the air itself. 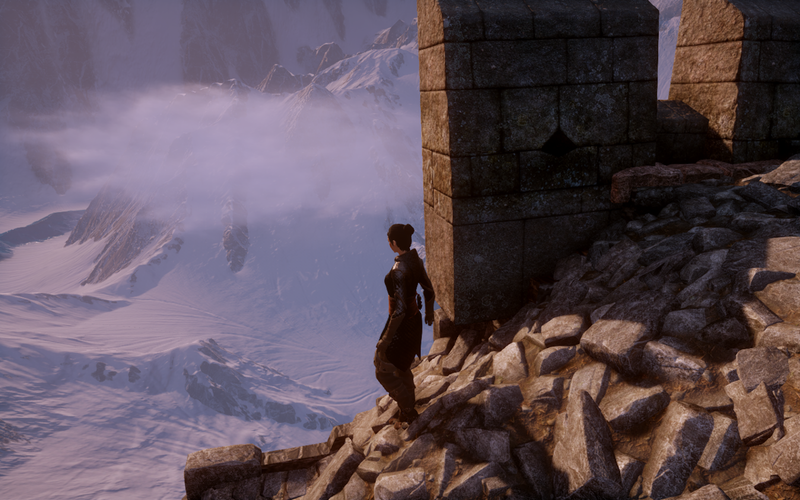 SPOILER WARNING: Not just on Dragon Age, all of it (hello! ), but also on The Lord of the Rings. Proceed at your peril! Ever since I was a kid, I've been fascinated not just by fantasy timelines, appendices and codices, but by the ways in which they can enhance our understanding of a story. For instance, at nine or so, after the bittersweet gorgeous devastation of the ending of The Lord of the Rings when Sam comes home? I refused to acknowledge it. Nope. Nada. So I always just kept right on reading, right through the Appendices. Right on forward. I couldn't help it. More pages meant I was still there. The story wasn't done. And so I'd read about obscure kings in Middle-Earth. I'd read about the histories of the dwarves and elves and hobbits and beyond. I'd scribble runes. I'd go through and translate stuff like the inscription on Balin's tomb. Or the cover runes on my copy of The Hobbit. In short, I would have read anything Tolkien gave me. Anything. I just knew I didn't want to stop. I didn't want to leave Middle-Earth. I didn't want to let it go. I wanted, to echo Liz Lemon, to go to there. I was under a spell. And begging Tolkien silently to give me the tools to do so. And I know we all know this feeling. All of us. If I built a blanketfort right now, one that had Samwise or Fenris or Varric on the platform, let's face it—I know it would be pretty full of amazing people all going, "JUST LET SAMWISE BE MAYOR OKAY?" To go a little Disney on all our asses, I'd quote Disney geniuses Mack David, Al Hoffman and Jerry Livingston that "a dream is a wish your heart makes." And they knew what they were talking about. Fantasy gives us that. As does something as simple and stark as a timeline, a tale of years. After all, what do we readers wish for more than anything? For the story not to end. And here Tolkien was actually giving me that with the Appendices! Actually giving me that. I just knew I didn't want it to be over. I had been so immersed I hadn't been able to leave the story yet. So I just kept reading. Right on through. Even at nine years old. Forging through the Annals of the Kings and Rulers, through the Family trees (squinting down at who Merry and Pippin married! ), at the languages! But most of all, at the Appendix on "The Tale of Years." Oh, I'd especially loved that. I'd just adored it. It was food for my fantasy soul. It was like code. Like Tolkien giving me a gift, a sneak peek at "here's how it started" and also, deliciously, at "here's how it ended years later." As if he'd grinned and winked in a cloud of pipesmoke and magic and huggably distant Englishness. "And most people won't know this because they won't read this. But if you read this, you'll know!" So that's a big thing with me. But I also love the way a timeline's confluences can further enrich the story—like, realizing that Dorian was born the same year a 12 year-old Anders was being led off in chains from his family simply because he woke up one day and had magical powers. Or realizing that Dagna, Cullen, and Alistair are all the same age! I did not—I absolutely did not—do this by myself. I simply wanted to assemble all the threads and create a nice tidy web. So while I attempted to rewrite as much as I could, you may find rare content similar or identical to that of the Dragon Age Wiki timeline, and others, occasionally. It is also a work in progress, so it will continue to morph as I find and fix more things. And seriously a dozen more—little comments here by the writers, or little tidbits there. I just wanted to try to bring it all together. Here we go—what can you fill in on these gaps? Please comment, tweet or e-mail me! (Alternative) Birth of Solas in "a small village to the North." -7600 Ancient - Founding of Arlathan. -7500 Ancient - The Unknown War. The Evanuris defeat the Forgotten Ones. -7500-5500 Ancient - Elgar'nan defeats a Titan. Ghilan'nain is raised to godhood. Andruil hunts the Void and (possibly) brings back the Blight. Andruil is defeated by Mythal. Falon'Din is defeated in his own temple. Mythal defeats a (possibly Tainted/Blighted) Titan and appears to hide access to it beneath the earth. -5500 Ancient - ~(Estimated) Mythal, viewing the Evanuris lust for power, can no longer broker peace. She may call Solas into the physical world to protect her -- or this is the point when she simply asks him to serve her against the others. Physical appearance or birth of Solas. -4600 Ancient - First contact between Elves and Dwarves. -3100 Ancient - Murder of Mythal. Creation of the Veil. Banishment of Evanuris and Forgotten Ones. 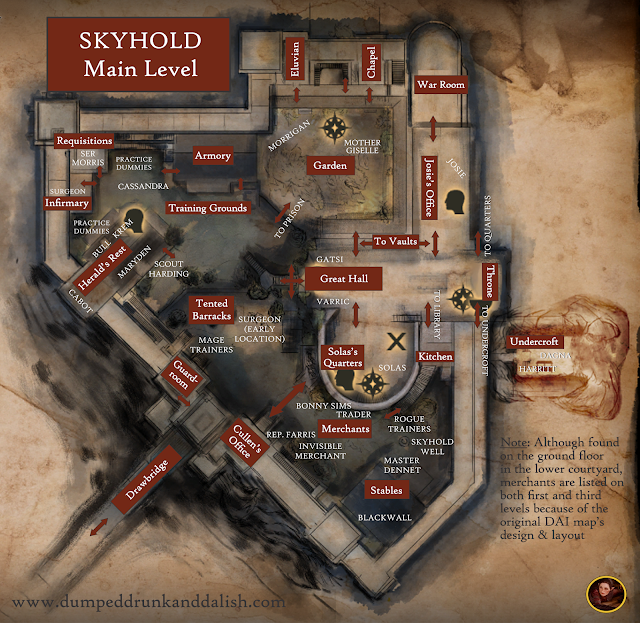 Skyhold's foundations are damaged, and Solas falls into slumber. Humans (the Neromenians) appear in Thedas, settling Qarinus, Tevinter, Neromenian, and Barindur (ultimately forming the Tevinter Imperium). -2415 Ancient - The Alamarri tribes cross the Frostback Mountains and settle what will become Ferelden. Legends say they were fleeing a "shadow goddess," which Solas later confirms as truth. -1815 Ancient - The Alamarri who live near Lake Calenhad break away from their brethren to become the Avvar. -1610 Ancient - Disappearance of the Kingdom of Barindur (later revealed to be obliteration by volcanic eruption, per Solas). -1595 Ancient - Thalsian, First Priest of Dumat, wields blood magic (an ability he claims came directly from Old God Dumat himself). -1415 Ancient - The Chasind separate from the Alamarri and settle the Korcari Wilds. -1207 Ancient - Neromenian merges with Tevinter as Darinius, High King of Neromenian, ascends the throne of Tevinter. -1200 Ancient - Dwarven Provings become popular in the Imperium, and a Grand Proving arena is built in Minrathous. -1195 Ancient - Tevinter Imperium founded. Darinius takes the throne of Tevinter, uniting Qarinus with Tevinter. -1170 Ancient - King Endrin Stonehammer declares Orzammar the new dwarven capital, replacing Kal-Sharok. He also oversees the construction of the Stonehammer Hall in Orzammar. Orzammar Proving Grounds are also expanded for the stagings of Grand Provings. The first victors here become the first Paragons of Orzammar, and King Stonehammer builds a hall of huge statues to honor them. -1160 Ancient - Taxes benefiting Orzammar begin to adversely affect Kal-Sharok profits. -1131 Ancient - Endrin Stonehammer is declared a Paragon. -981 Ancient - Tevinter declares war on Arlathan and the siege against the elven city begins. -975 Ancient - Fall of Arlathan and disappearance of the city (reportedly) beneath the earth. Flight of the elves. The elves who remain are enslaved by Tevinter. -895 Ancient - Tevinter conquers almost all of Northern Thedas. -880 Ancient - Tevinter settles the island of Estwatch, strengthens its bay and creates a port for repairing warships. -760 Ancient - Archon Almadrius ascends the Tevinter throne. -715 Ancient - Tevinter succeeds in major pushes against the Alamarri and builds the Imperial Highway across the Frostbacks to Ostagar. -695 Ancient - Western Tevinter splits away to form the Anderfels. -692 Ancient - Death of Almadrius by assassination. His apprentice Tidarion inherits the throne, and civil war breaks out in the Tevinter Imperium. -640 Ancient - Death of Tidarion. With no heir to the throne, war continues and magisters struggle for power. -620 Ancient - Establishment of Emerius (eventually to become Kirkwall) by the Imperium as a slave and jet mining settlement. Archon Parthenius claims the Tevinter throne and the civil war ends. -535 Ancient - The Anderfels are retaken by Tevinter. -410 Ancient - A group of Kossith lands in the Korcari Wilds and establishes a colony there. -395 Ancient - The Magisters Sidereal (including Sethius Amladaris, who becomes Corypheus) sacrifice several hundred slaves in a massive blood magic ritual order to attempt to conquer the Golden City. They enter the gates of the city, then fall to their deaths, irrevocably tainted as darkspawn. Later, Corypheus will note that the city was already black and the throne of the Maker was empty. -380 Ancient - Darkspawn decimate the thaigs of the Deep Roads then emerge around Tevinter from the Deep Roads and wreak havoc. -355 Ancient - The Alamarri war with the Avvar, and at the Battle of Red Falls, Alamarri warrior Luthias Dwarfson battles the Avvar warrior queen Morrighan'nan. Both are slain, and the Order of the Ash Warriors is founded to honor Dwarfson. -305 Ancient - Founding of the Grey Wardens at Weisshaupt. Nakiri of Donark Forest suggests the use of darkspawn blood and the Joining Ritual is created. -295 Ancient - (Estimated) Birth of Shale. -255 Ancient - The dwarves learn the secret of creating Golems. Shale becomes a Golem. Caridin, creator of the Anvil, is sentenced to become a Golem himself in punishment. -248 Ancient - Caridin vanishes with the Anvil. -213 Ancient - ~(Estimated) birth of Maferath to Heggar II and Thelois. -205-201 Ancient - ~(Estimated) birth of Halliserre, sister of Andraste, to Elderath and an advisor on alchemy. -203 Ancient - Death of Archdemon Dumat at the Battle of the Silent Plains. End of the First Blight. Birth of Andraste in Denerim to Brona and Elderath. -195-185 Ancient - Darkspawn are fought back to Deep Roads. Rite of Conscription is created for the Grey Wardens. -191 Ancient - Corypheus awakens from dormancy. -190 Ancient - ~(Estimated) death of Halliserre, sister of Andraste, in a mysterious and magical accident in a wood. -189 Ancient - Sashamiri traps Corypheus using the blood of Dumat, then imprisons him in a tower in the middle of the Vimmark mountains. -187 Ancient - Marriage of Andraste to Maferath. -186 Ancient - Andraste is captured and enslaved by Tevinter soldiers, who obliterate their Alamarri settlement and kill Elderath, father of Andraste. Maferath negotiates Andraste's freedom from her Tevinter captors and assumes leadership of the Alamarri clans. Andraste begins to preach of the Maker. Maferath uses her preaching to unite and further lead the Alamarri clans. -186-181 Ancient - Birth of Isorath, Evrion and Verald to Maferath and concubine Gilivhan. Birth of Ebris and Vivial to Andraste and Maferath. -185 Ancient - Construction begins on the Grand Cathedral in Val Royeaux. -184 Ancient - Minrathous rebuilds and the Chasind claim the fortress of Ostagar. -181 Ancient - Corypheus is moved from his former tower and imprisoned beneath the Vimmark Mountains by the Grey Wardens. -180 Ancient - Maferath and Andraste lead a horde of barbarians across the Waking Sea in an assault upon Tevinter, inciting slave revolts as they pass. Southern Tevinter begins to collapse. Tevinter abandons Estwatch, which remains uninhabited for several ages. -171 Ancient - Shartan leads a slave uprising against Tevinter forces, then allies with Andraste to help Maferath's army win the Battle of Valarian Fields. After the battle, Andraste names Shartan her Champion and gives him her mother Brona's sword, which he renames Glandivalis. Shartan converts to Andraste and the religion of the Maker. Maferath secretly makes a pact with Archon Hessarian. Vivial, daughter of Andraste, and Regulan, her mage lover, flee into self-imposed exile shortly before the betrayal and death of Andraste. -170 Ancient - Before Andraste's army can attack Minrathous, Maferath secretly betrays Andraste at Nevarra while pretending public outrage at her capture. Andraste is set on a pyre before the gates of Minrathous. Shartan and a hundred elves charge the pyre in an attempt to free Andraste, but are killed in the attempt. Havard, childhood friend of Maferath, is mortally wounded then healed by the ashes of Andraste, which he takes away with him back to Ferelden for safekeeping. -165 Ancient - Maferath is given most of Southern Thedas to rule, taking Ferelden for himself, and dividing Orlais, Nevarra and the Free Marches between his sons. Isorath is given the rule of Western Tevinter (later Orlais). Evrion is given the East (The Free Marches), and Verald is given the central Planasene (Nevarra). Maferath grants the elves a new homeland in the Dales. -160 Ancient - Archon Hessarian converts to the religion of the Maker and reveals the betrayal of Maferath. Maferath and his court are abandoned then slain in retribution, sparking chaos in Southern Thedas. Hessarian converts the Old God temples into the first Circles of Magi. ~(Estimated) Verald's court in Nevarra is slain upon the revelations about Maferath and he flees to Orlais. Verald struggles for power with Isorath then conspires with Jeshavis, the wife of Isorath, to murder his brother. Death of Isorath and all of his children. Marriage of Verald to Jeshavis. ~(Estimated) Birth of Alli Vemar to Ebris, daughter of Andraste. -155 Ancient - The Ciriane (in what is now Orlais) unite for the Grand Unification. ~(Estimated) death of Verald at the hands of Jeshavis. Jeshavis becomes the first Ciriane leader of Orlais. -152 Ancient - ~(Estimated) death of Ebris, daughter of Andraste, by plague. -140 Ancient - The legendary and heartbreaking Long Walk to Halamshiral by the elves. ~(Estimated) death of Alli Vemar, granddaughter of Andraste. She dies married but childless, in an accident while voyaging to Denerim. -135 Ancient - Strife and warring among the Alamarri in Ferelden as warlords vie to succeed Maferath. Disappearance of Andraste's ashes (which have been secretly relocated to the Temple of Sacred Ashes in Haven). -130 Ancient - Creation of the Chant of Light by the disciples of Andraste. -125 Ancient - The Chant of Light increases in popularity and the religion spreads. Hessarian dies in his sleep. Leaders in Eastern and Southern Tevinter argue for secession out of fears that Hessarian's successor Orentius will restore the religion of the Old Gods. -120 Ancient - Rebellion in Rivain, which attempts to split off from the Imperium, aided and supported by several Free Marches city-states. -100 Ancient - Founding of the Inquisition, which begins pursuit of heretics and apostate mages in the name of the Maker. -53 Ancient - Tevinter loses the Battle of Temerin and abandons the East. -44 Ancient - Founding of the kingdom of Rivain. -30 Ancient - The city-state of Antiva expands to become a nation in its own right. -25 Ancient - Emerius falls in a slave rebellion and, once free of Tevinter, is renamed Kirkwall. -15 Ancient - The dwarves seal off the last of the Deep Roads, cutting off access to Kal-Sharok. -11 Ancient - As the religion of Andraste spreads, Kordillus Drakon (King of Orlais) becomes a follower. -3 Ancient - Kordillus Drakon unites the Heartlands tribes and is crowned Emperor of Orlais. He then formalizes the Cult of the Maker, creating the Chantry. So that's part one... next up, let's look at the ages to come! Divine, Glory, Towers, and beyond! And please let me know—have I missed anything? Anything I've got wrong? Let me know in your tweets, comments or on my Facebook page! This is so fascinating, as can only be expected from you!! I love this blog so very very very much. I spend a lot of time thinking about the deep history of Thedas. My day job is as an academic though, so it kind of kills me not to be able to chase up on the sources for the entries in the timeline! I know it would be a huge undertaking to add citations to the work already done here, but maybe you could incorporate footnotes into the next instalment in the timeline series? I'd love to be able to read the codex entries and novels that are the original sources! Thank you so much for all that you do!!! Thank you so much, Elana! That means a lot, and I'm so delighted that you're reading and responding, as always. I really should have footnoted everything here but so much of it was also supposition and reconstruction. For instance, we have no dates on when Andraste's sister is born or when she dies, but we know from WORLD OF THEDAS that Andraste appears to be early teens (and that it was 10 years before she could have children). So that allowed me to guess at when Halliserre was born (and died) and also allowed me to figure out when Andraste's daughters were born, etc. I've already updated the Ancient timeline here a few times this evening, and would look forward to your further insights or changes! This is just such a cool project so it really gets my blood pumping to think of what it can become! "The definitive timeline", nnh, that would be great! I think, in broad strokes, it would be most useful to be able to distinguish absolute historical dates (i.e. per in-game codex entries, though we know those are not always correct or without contradiction), implied dates or date ranges derived from in-game narration (whether dialogue or other expository game storytelling means), dates derived from extended universe sources (references book and novels), and also interpolations made by fans that follow from any of the above (like Halliserre's dates)! This way the timeline can be seen more as a network of facts rather than a sequence of data points of unknown relative epistemological weight. You know? Thank you for your notes and suggestions. I think I should try to back up my thinking on each entry; it's just gonna be challenging. Still, I'm working on a document version of the entire timeline with links and comments to reference links/lore. Just a quick update -- now that I've posted a semifinal full version just this weekend, I am going to work from that as my final draft, and will be fixing that per notes and changes from readers and BioWare folks. I will also be attempting to create a PDF/document version that will include links and citations. It will be an ongoing work in progress but hopefully helpful at some point. More to follow! -181 Ancient - Corypheus is imprisoned beneath the Vimmark Mountains by the Grey Wardens. I suspect only one of these is correct? Thanks, Rob! Oops! I need to fix those. At first, I thought Corypants was imprisoned in the Deep Roads right away, but it looks like -- upon additional digging -- that he was captured and held in two different places. I've fixed that reference -- many thanks!